Stratis could be about to join in with the bull market frenzy soon as the project announces the imminent arrival of its new 2019 development roadmap. The updated roadmap intends to set out Stratis’ new ‘long term growth and goals’, however there isn’t any mention of whether any new features will be included in the release. The #59 cryptocurrency is currently up 4.20% against the US dollar and trading around the $1.22 mark (AToW). 24hr trading volume has also seen a marked increase of $2 Million as bullish investors return to the market after a quiet weekend. Will a new roadmap provide the eagerly-awaited push STRAT needs to break out of its 70-day accumulation, and begin retracing back to its Q4 high at $1.70? Let’s take a look. 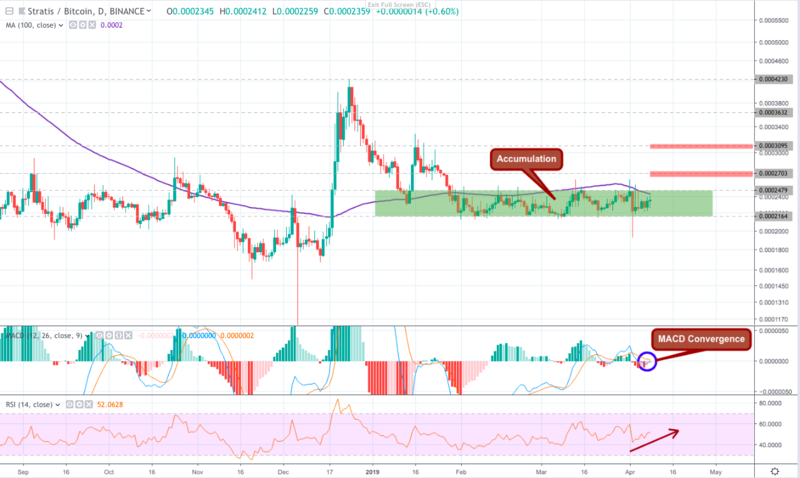 On the 1D STRAT/BTC chart we can see that the asset has been tightly range bound between the 21,640 and 24,787 Sats levels since January 29. When assets accumulate in this way, it is usually expected that a strong breakout will occur. Depending on market sentiment and fundamentals at the time, an asset can break in either direction. Looking back over the last 70 days, we can see that STRAT has failed to successfully close above the overbearing resistance on several occasions. This resistance has also been reinforced by the 100 day SMA, which has added additional pressure on bullish traders during each breakout attempt. If candles begin to close above the 100 SMA, it will give us our first strong signal that Strat is about to break out of accumulation and will likely head up to the first projected price target above. Looking at a number of 1D momentum indicators right now, we can see that buying pressure is beginning to pick back up again after the asset corrected from the last resistance test on April 2. The signals are not particularly strong at the moment, but further support could arrive throughout the rest of this week to deliver a promising bull run in time for the new roadmap release. On the MACD indicator, the 12MA is closing in on the 26MA as short-term momentum increases. Bearish candles on the histogram are also decreasing which hints that a trend reversal is likely. The RSI is now starting to climb beyond the 50% midpoint on the index channel. All ROIs are calculated from the asset’s current value at 22,970 Sats.